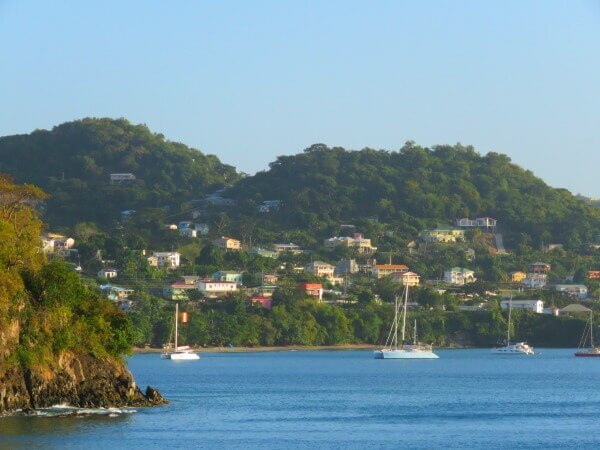 Grenada was the first stop on the Disney Wonder Southern Caribbean Cruise. 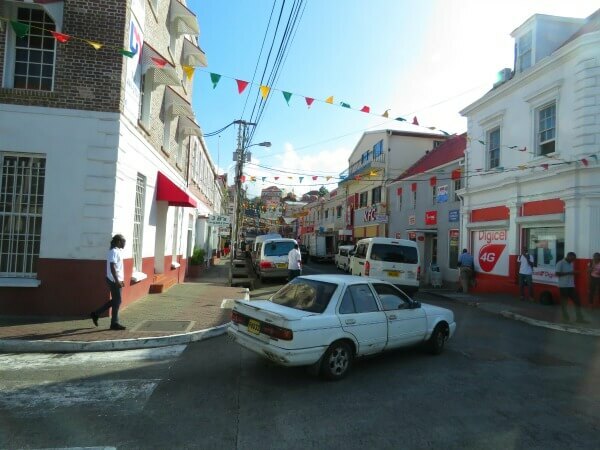 My only prior knowledge of Grenada came from the Clint Eastwood movie, “Heartbreak Ridge.” Not knowing what to expect, we wanted to explore the island in a controlled setting. So, we chose a Disney Port Excursion. Most of the excursions involved rum, which provoked no interest from us. 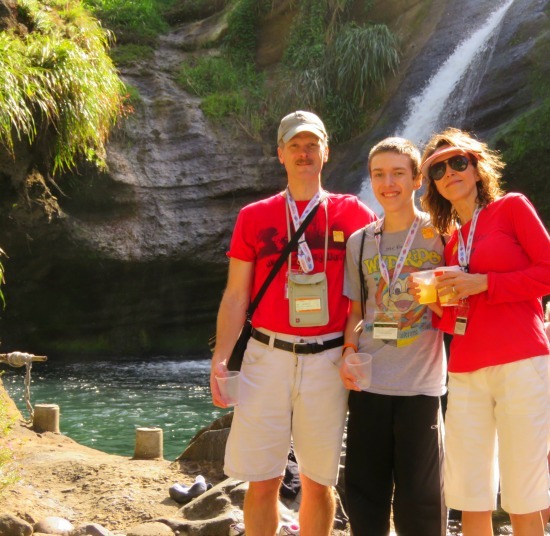 We chose the Grenada Waterfall and Spice Tour in hope of seeing beautiful scenery and learning about the “Island of Spices.” This was a half day tour involving three stops: a rainforest waterfall, a slave era cocoa plantation, and a nutmeg factory. We piled into a bus holding about thirty people and drove off through the streets of St. George and up into the mountains outside of town. The bus was comfortable with large windows to take in the views. There were many scenic views of Caribbean coast along the twisty, narrow roads; more so though, were views of the poverty that plagues the island. High up on a mountain, about a 45 minute drive from port, we arrived at the waterfall, a beautiful, little tourist trap. 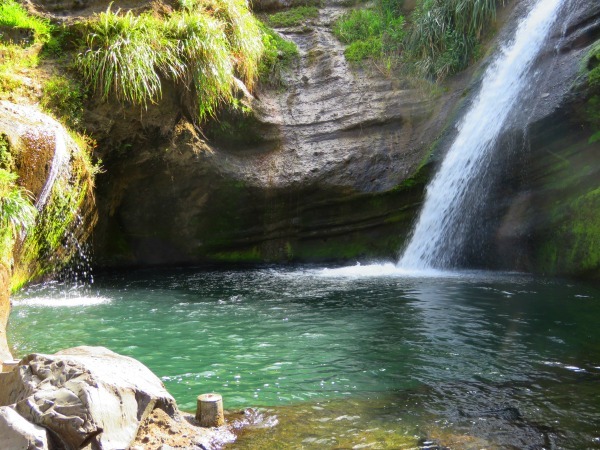 Fresh, clear spring water plunges over a small cliff into natural pool and then on down the slope toward the sea. The waterfall and pool have wonderful vistas and photo opportunities. It is surrounded by small booths selling spices, rum, juice, trinkets, and t-shirts. We were urged to descend steps down to the pool. We were then told that we could swim in the pool. None of us were aware that this was an option prior to the excursion and thus none of us were prepared. We were directed to look to the top of cliff where two local youth were standing. Soon, they jumped from the cliff into the pool. They then proceeded to hawk for money. The young men and the merchants were fairly aggressive in their “marketing,” which soured the experience. Dougaldston Estate, an old colonial cocoa plantation, was a high point of the excursion. While not necessarily scenic, it was a living history lesson on how cocoa and other spices were, and in many cases, are produced. The labor required, originally by slaves, to produce the cocoa and spices was evident. The heat and humidity were felt just taking the tour, reinforcing just how much toil was involved for the workers. 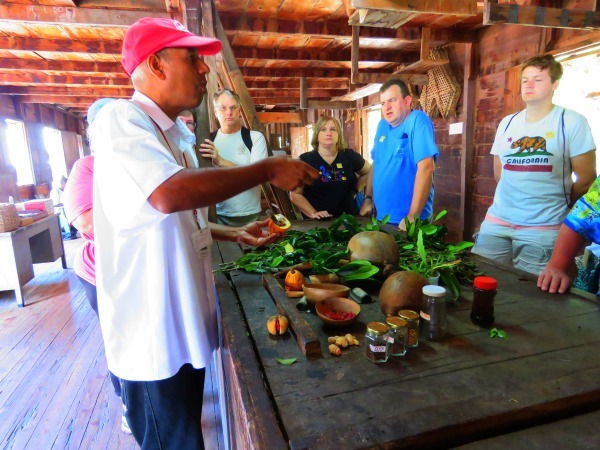 Our tour guide led us through the plantation and talked about the many spices of the island. It was educational and well worth the stop. Again, our tour guide was excellent. We were given samples of handmade ginger candy which was sweet, spicy, and delicious. There were women selling spices and candy here, but they were pleasant and not aggressive. 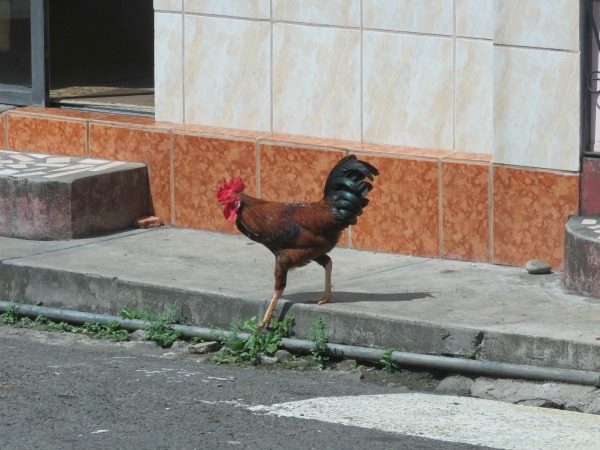 A chicken on the street near the Nutmeg factory. We were asked to not take photos inside the factory. Grenada produces 40% of the world’s nutmeg. The nutmeg factory was not what I had envisioned. Everything was done by hand; no automation. It was a basic, dusty, warehouse with the pleasing aroma of nutmeg filling the air. Stacks of 40 pound bags filled with the spice lay in piles on the floor marked for Denmark and Germany. This tour was given by a factory manager. Unfortunately, several tour groups joined together for his tour. With the now large group and the bustle from the hard work around us, I really could hear almost nothing that was said. I would have liked to have learned more and left disappointed. 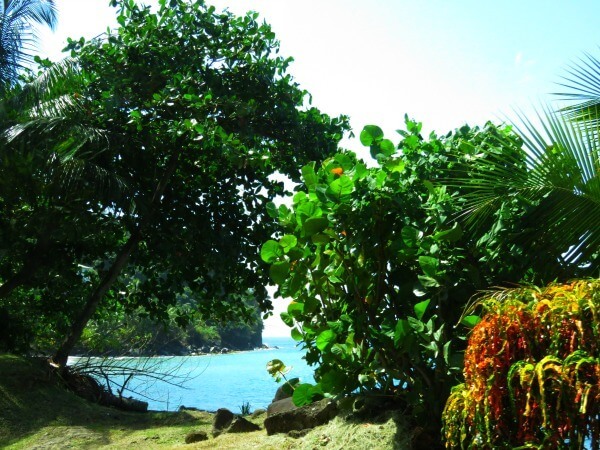 If you want to see the beauty of Grenada, flowers and beaches, then the Grenada Waterfall and Spice Tour is not for you. 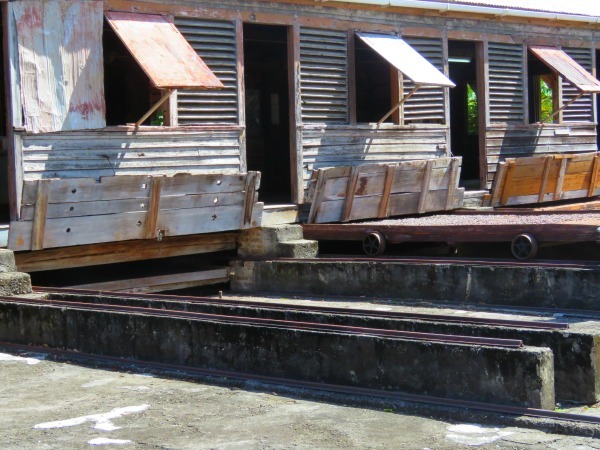 If you want a view into the life of most of the citizens from Grenada, then you likely will appreciate this tour; although the Nutmeg factory was not well presented. 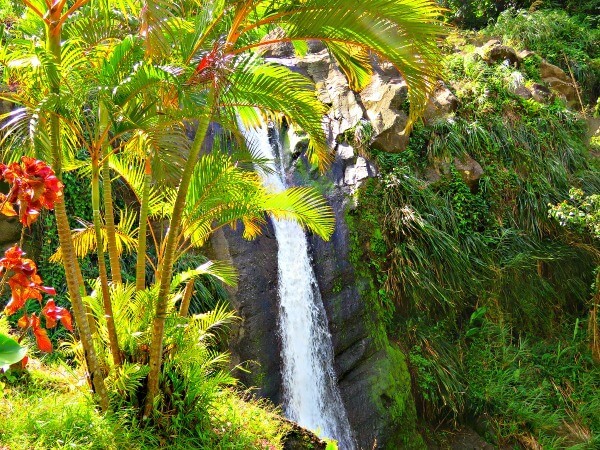 If you want to learn about the history and politics of Grenada, then the Grenada Waterfall and Spice Tour is a good option. Highs: tour guide, views during the ride, Dougaldston Estate. If we make it back to Grenada, we will not repeat any of the spice, rum, or factory tours. We will do a better job reviewing tours ahead of time. That was a very honest and up-front review. “beautiful, little tourist trap” – I understand those words all too well. My husband actually wrote this. He was right though. We had never been to an island or done an cruise excursion. The other excursions we booked were good. This one was informative but I wish I had chosen snorkeling instead. Great tips. We really want to go to Grenada but we’ll probably skip that tour. I would like to go back and skip the tour! I would like to snorkel and do other things as the island was really beautiful! Sadly, that’s part of the problem with those prefab tours, they aren’t always a good fit for everyone. With only a short time frame away from the boat, those tours seem the best bet until you’re on them. 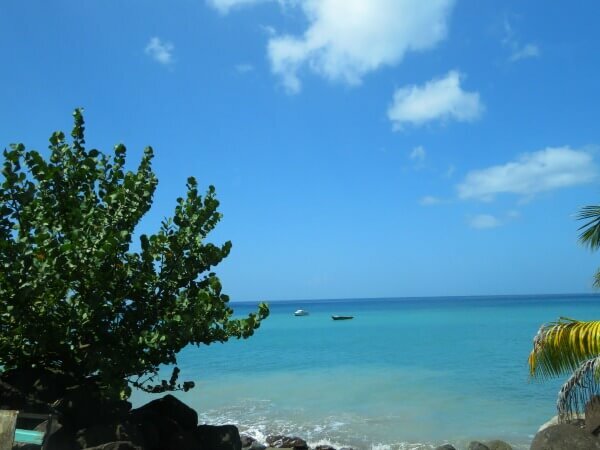 Hopefully, you will visit Grenada again and get to explore on your own time. That is exactly what I am hoping for. Really all of the other tours were good to great; esp. on Antigua! I am still glad we got to do it, but I wish I would have chosen what some others did; just sitting on the beach and there was a snorkeling trip I really wish I had done. Love these spice tours! We did one on Zanzibar, just a great way to discover the island, history and food all together! Grenada looks like paradise! It was quite educational! I did get an eye-opening look into the poverty on the island and the guide informed us of the politics. I had never been to an island. It was very beautiful. Prefab tours like that always seem to disappoint. Too geared to foreigners instead of teaching the real deal. Our other tours, which we will write about in the coming weeks, were better. This one wasn’t bad, it did disappoint, though. Ahh another tourist trap. I hope you guys enjoyed it regardless! The only part that was a tourist trap to me was the waterfall, although, as you can see from the photos, it is a picturesque setting. The blues of the sky tell me the place is relatively pollution-free! Am I right? The air was clean and sky clear. There is really no industry other than nutmeg which is all hand done. Everyone does drive a car, but it did not seem to make a difference. I am with you. I like the cultural insights and beautiful sites. 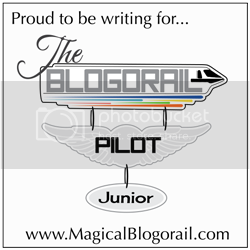 I just wish we could have heard the factory tour and I am put off by any pushy salesperson, anywhere. Quite an honest review there, I liked the small pool at the bottom of the water falls, what a pity they had not intimated about this earlier. Looks like a great place to have a cool dip. The pool was beautiful and inviting. We missed out. Thanks for the honest review. I’ll look for your other ones. Based on your advice I would probably skip this one. Thanks. We will investigate better next time. You’re welcome! Sorry I’m so late replying. Our comments sections is messed up. Yes, I would advise to skip this tour.